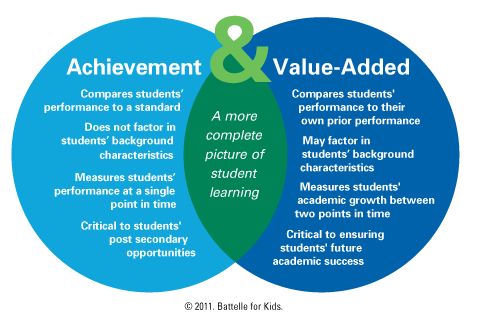 Value-added analysis and achievement scores are related, but different in important ways. Each measures has its own focus. Achievement scores simply reflect students' performance on state tests. Value-added analysis measures achievement growth over a period of time. Achievement scores are important, but value-added analysis provides truer measures of whether schools and educators' practices are improving student learning because is also controls for the initial achievement levels of students as they begin the school year and other important factors that contribute to students' test results.